Home » Posts » Attentionology for K-5 Teachers » Pop Out a Pop-Up Book! 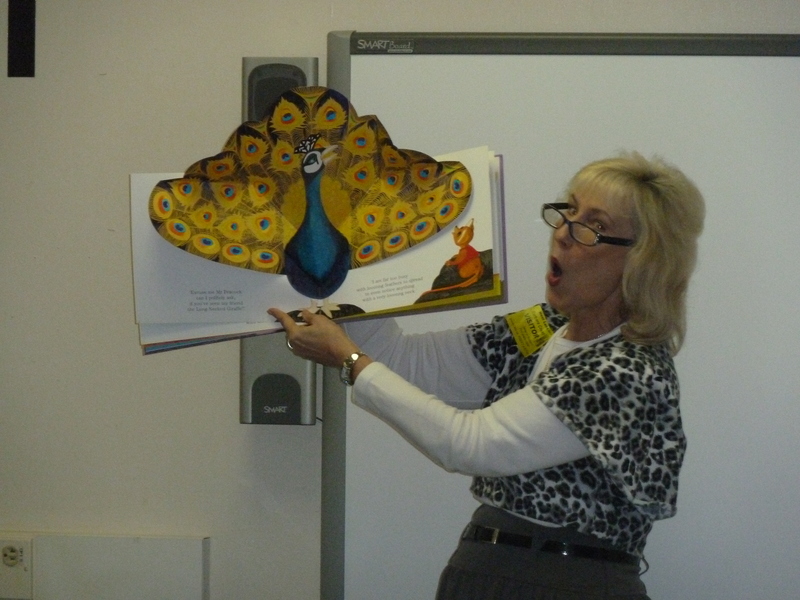 Check out my blog pic below and see if you agree with other teachers who have “ooohed and aaahed” at this pop-up peacock book that it was a bargain at the dollar store where I bought it! True story…I paid one buck for a big bang of an attention-getting tool that’s perfectly suited to K – 2 students. and the peacock said, "I'm so proud of my feathers!" …sometimes you can choose to connect the tools you use to catch and keep K – 5 children’s attention to world news. That is, of course, when you find stories online or elsewhere that are age-appropriate for your students and the timing of the news release works for what you’re teaching. For example, I’ll be able to take the peacock news story and the peacock pop-up story book with me to the first schools I visit in the 2011 – 2012 school year. The news will still be fresh. I usually share the peacock story book when I present day programs for K – 2 classes to develop language appreciation and help kids learn to love to read and write. One obvious answer is that news puts people in touch with the world community and there’s no question that (filtered) global awareness is an asset for even the youngest members of our global community today. Even young children can be encouraged to look for news in school, at home, at medical offices, etc. For grades K – 2 you can announce that it’s time for NEWS once a day, or once a week to catch the class’ attention. You can use a variation of this concept – NEWS FLASH – with students in grades 3 – 5. The key word for older students is “flash.” It’s happening right now! Can pop-up books work for upper elementary level kids? I say yes, but only when you present pop-ups that are sophisticated in their construction and writing, or better still…when you invite students in grades 3 – 5 to make their own! Talk about amazing pop-up books to create…check out Robert Sabuda’s website. You may have heard of this world-famous engineer turned children’s book designer/author. What a great way to introduce engineering to third, fourth and fifth graders – show them books that have been engineered as well as written and illustrated! Here’s another idea for grades 3 – 5…coordinate with the K – 2 teachers in your school and challenge your upper level students to make pop-up books they can read to help younger students learn basic skills. One student, for example, could design a counting pop-up book. Page 1 would have a pop-up of the numeral 1…and so on – fun and functional! Some upper elementary students may even aspire to make pop-up pictures that rival Robert Sabuda. It’s unlikely that you’ll find Sabuda’s amazing books at a dollar store, but we frugal teachers will keep checking anyway. In the process, who knows what other tools we’ll find on the cheap that we can use with teaching tricks that are worth their weight in gold. 2 Pings/Trackbacks for "Pop Out a Pop-Up Book!"